If you like to go hiking often, you are a true adventurer, you will normally go through that you run out of coverage in the cell. The more reliable option to stay connected with the rest of the group and with the family is to bring a satellite phone. However, if you’re a fan that comes out once in a while to the field, with a few walkie talkies is more than enough to be able to communicate in the case of someone in the group is disorientated and lost, or simply because they take another route or go to another rhythm. There are a myriad of models to choose from, but we will save the search and then we tell you what are the best walkie talkies that you can buy right now. Midland is a manufacturer of walkie talkies from several decades ago and, however, keeps finding new ways to innovate. As for example, with the model GXT1000VP4, which has 50 channels, 142 codes of privacy and an impressive range of 36 miles (58 kilometres). It also comes with a backlit LCD display that is easy to read in the dark, 10 customizable alerts for incoming messages and a way to whisper to communicate in situations in which remaining silent can be a priority. These walkie talkies are also rugged, waterproof, and come with a few packs of rechargeable batteries that can keep them working for hours. Beyond its basic functionality, the GXT1000VP4 were specifically designed for use in emergency situations. To do this, are equipped with an SOS alarm that can alert others when assistance is urgently needed, and comes with a weather alert radio built-in of the National Oceanic and Atmospheric Administration (NOAA) to keep the users informed of the changes in the weather conditions. Midland even includes two microphones to communicate with hands-free. 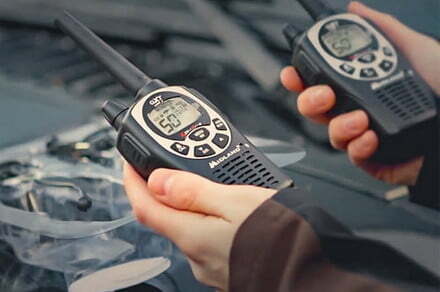 If you are looking for a walkie talkie to go fishing or sailing, then do not look beyond the model Motorola T600. Robust and reliable, the T600 is water-resistant (certified IP67) and is able to withstand most of the rain or immersed up to 1 meter of depth during 30 minutes. Even floats and has a flashlight activated by water for added security. The radio has a range of 35 miles (56 kilometers), but a large number of variables influence the performance in the real world (including the terrain, altitude and climate). This theoretical range of 35 miles is just that: it can only be achieved on a flat surface in ideal conditions. What matters are the test of real life, and this device has demonstrated its effectiveness. The T600 has a power output of 1.3 watts in height and covers more than 2 miles (3.2 km) when you have a clear line of sight. When you are in a forest, the range is closer to half a mile (800 metres) or a mile (1.6 km). The T600 offers 22 different channels and 121 codes of privacy to keep your messages completely private. It is equipped with a red LED for night vision and a NOAA weather radio to receive alerts of severe storms. The device has a useful life that is acceptable and uses rechargeable batteries (included) or three AA batteries. From a general point of view of quality and design, the CXT 1035R FLT Cobra is a hard product to beat. This two-way radio has a range of up to 37 miles (59.5 kilometres), distance more than enough for the majority of the outputs. The walkie talkie also has water resistance certified IPX7, which means you can submerged to a depth of one meter for 30 minutes without fear of damage. And as it is designed to float, in principle you shouldn’t have to worry about sagging. Beyond that, this model also features a series of LED lights that work as a flashlight in a pinch, and a weather radio built-in NOAA providing alerts in emergency situations. It offers support for a charger, dual-port, as well as alkaline batteries for added versatility. However, one of the most impressive features of this unit is its voice recognition technology. The walkie talkie really detects your voice, allowing you to communicate fully with the hands-free, which is very useful when you’re hiking or climbing. Our favorite feature of all could be the function “Rebovinar-Say it again” that automatically records the last 20 seconds of incoming messages to the playback of the audio lost. Midland gets its second entry on this list thanks to its affordable and versatile model LXT500VP3. This two-way radio features 22 channels, a range up to 24 miles (38.6 kilometers), and the option to automatically search the frequencies for any transmission activity. These walkie talkies, which operate with a few packs of rechargeable batteries included or with four AAA batteries, are also part of a configuration of the high/low power which allows the user to adjust transmit power to conserve battery life. If you know that you don’t have to cast very far, you can reduce the power and increase the useful life of the power cells installed. If the batteries are new and fully charged, increases the power settings for transmissions further away. Other useful features include the technology of automatic silencing to help keep the noise to a minimum, an incoming call alert which automatically notifies you when someone in your group is contacting and keypad lock that prevents accidentally changing the settings. There is even a mode of silent operation, which prevents the noise completely, allowing the user to re-stealth. As if all this outside little, the Midland LXT500VP3 is sold for only $40 dollars, making it one of the teams of walkie-talkie more affordable in the current market.